” of his anger and guilt. The experience embodies the life of Tutu, who received a Nobel Peace Prize in 1984 for his heroic, unrelenting efforts, as Archbishop of Cape Town, to bring peace and justice for disenfranchised blacks and other people of color in his homeland of South Africa. Tutu, who became the first black bishop of Johannesburg and first black archbishop of Cape Town, was mentored as a boy by Father Trevor Huddleston, a white immigrant from England, who became an important anti-Apartheid activist, both in and outside South Africa. After the end of Apartheid, Tutu was chosen to head the Truth and Reconciliation Commission (TRC), the body established by South African law in 1995 to bring restorative justice through reconciliation between those who had been harmed by Apartheid and those who had committed the harm. The story portrayed in this account carries a strong theme about the power of forgiveness to overcome hatred and vengeance, which was the TRC’s core purpose. Thus, it is no surprise that the narrative seems more message-driven than a subtle account of two boys who find a way to reach out to the other after having caused hurt for each one, which often can happen in childhood escapades. Still, the message is conveyed largely through the words of Father Trevor (and seems more natural coming from him) and is balanced with action that advances the simple plot. who shouted the mean word and his companions as not the same race as Desmond. In addition, the text does not identify the township, but it probably is Sophiatown, the suburb of Johannesburg that was subjected to forced removal of its multiracial (black, coloured, Chinese, and Indian) occupants in 1955, where Tutu spent his childhood well before that date. So it would have been entirely possible for the gang of boys to be non-black at that time, unlike after the strict enforcement of separate living areas for each racial group. This setting is authentically depicted in the oil-based, earthy toned illustrations of the township’s humble houses and dirt street and the reddish brown endpapers. In many illustrations, the perspective is lower than the sight lines of the characters portrayed in them, and expressions on their faces are vividly realistic. Two nighttime illustrations are purple-hued, and one of them is the single painting with a viewpoint from above, as if Desmond and Father Trevor are contemplating a higher power while they discuss Desmond’s readiness to forgive. A note with his photograph from Tutu addressing the child reader, an author’s note with photo of Father Trevor Huddleston and trumpeter Louis Armstrong, and the authors’ dedication to Father Trevor complete the book and reinforce its message and educational purpose. This title is the second collaboration between Tutu and Abrams after God’s Dream (illustrated by LeUyen Pham), a gentle homily for children about the power of forgiveness and empathy for others. 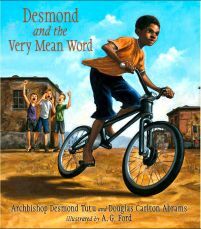 Desmond can be paired well with Niki Daly’s The Herd Boy, a story inspired by the boyhood of the other great national leader and Nobel Peace Prize winner, Nelson Mandela, which conveys the theme that even a lowly herd boy can aspire to become president of the new South Africa. Recommended.